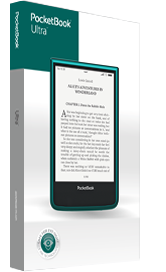 PocketBook presents the first serial E Ink reader with a built-in camera - PocketBook Ultra. Designed in a unique way, the new compact e-reader will give any user maximum opportunities: photo camera, LED frontlight, magnets to lock the cover - not a complete list of the unique features the new e-reader possesses. PocketBook Ultra is equipped with a E Ink Carta™ screen of the new generation with HD resolution 1024x758 pixels and 212 dpi, which displays information even more contrast and sharper. LED frontlight provides joyful reading, even in low light conditions and the new user interface let to adjust brightness even easier. The back panel of PocketBook Ultra is equipped with a 5 megapixel camera with autofocus. Built-in LED flash allows to make high-quality images regardless of lighting. Pictures can be used as screen savers for the device and transmitted to a PC, vivid color photos will add joy to your family archive. Preloaded application can recognize text and convert it into editable formats. The new e-reader supports more than 20 popular text and image formats and also has a set of preinstalled ABBYY Lingvo® dictionaries. E-reader functions are not limited to reading only: PocketBook Ultra can also play your favorite music in MP3. The device supports Text-to-Speech and can read books in a set of languages. 4GB of internal memory and a microSD slot allow to keep a whole library, and a powerful 1 GHz CPU and 512 MB of RAM provide smooth and rapid pages turn. Thin margins and flowing body lines make the new e-reader elegant and emphasize its unique design. 6-inch PocketBook Ultra is only 162.7x106,7x7,9 mm and weighs just 175 grams. Paging buttons at the rear panel allow efficient use of e-reader’s entire surface and significantly increase the number of options for holding the device. The New PocketBook User Interface, first used in the model, make using the device even easier and more comfortable. 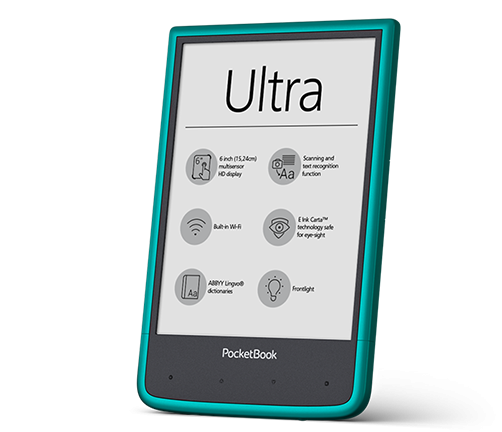 PocketBook Ultra - the maximum features in a compact size. Access to the Internet via built-in Wi-Fi opens opportunities for social networking via ReadRate service and pre-installed Dropbox and Send to PocketBook allow to transfer content to the device without connecting to a PC. Feel the unique combination of a sophisticated style and modern functionality.